Different kinds of bonuses are the main attractions which online casinos use to entice new customers. 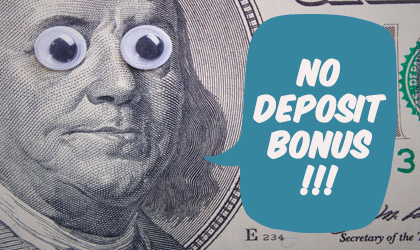 It is, therefore, no big surprise that no deposit bonuses have grown in popularity during the last few years. But what is it exactly that you get with them, and how do they function? We have listed quite a few bonuses below, and before taking advantage of them you should read below what to expect and how to use the bonuses. The steps differ a bit, and you should make sure to always read the instructions the casino lays out. Usually claiming the bonus is as easy as creating an account and activating it. Some sites use a bit older method and require you to use specialised bonus codes. You can find these codes in the promotions below. Just make sure you enter them on the right field when prompted to, lest you have to deal with customer service. You shouldn’t blindly stare at the numbers, as they do not tell the whole story. In fact, the bigger the numbers the better it is for you to check out the small text next to them. Usually, vast amounts of bonus money come with a lot more rules and conditions than few dollars, euros, or pounds worth of bonuses do. The more important part is choosing a casino that you actually want to play in. What the no deposit bonus gives you is a chance to get to know the casino without using any of your own money. If instead of this, you are looking for a free chance to win millions then you might be mighty disappointed with the bonuses. As you can probably understand, no deposit bonuses come with quite a few rules. Online casinos are no different in their functioning to other business, in the sense that they cannot just throw away money and expect to remain in business. The first thing you need to check is the wagering requirement. Some casinos require none, while others go in the high end to make sure you can’t actually cash out anything with your bonus wins. A normal wagering requirement with bonus money hovers around 40 - 50 times the original sum. Secondly, some online casinos limit the number of possible wins. This might be coupled with the need to do a deposit before you can withdraw the money. Though this seems a bit counterintuitive for a no deposit bonus, it is actually required to make sure that you are not abusing the bonuses, and to make sure everything is secure and honest. Thirdly, always, always, always follow the rules laid out by the casino. If the rules say that you can only bet x amount per spin, or that the bonus money needs to be played on a certain game, then you need to do so. Breaking any of the bonus rules is reason enough for the casino to deny you your wins, and legally so.